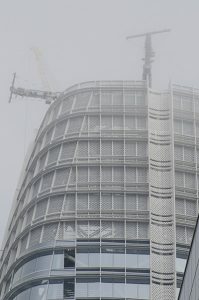 The new Salesforce Tower, in San Francisco, was a not-so-deep hole in the SoMa ground a little over two years ago. Now it’s completely topped out and at night some floors have lights in them. The six or so floors at the very top are also now lit at night. Don’t think there are any residents yet, but certainly soon. I have really loved being able to watch this project, from just a few miles away, and to be able to walk past the site almost weekly, observing how it has progressed. 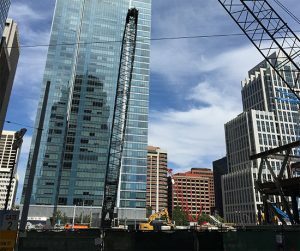 There’s a great time-lapse sequence, as well as selection of photos by date, on the Salesforce Tower web site. This photo gives a fairly surrealistic view from near Twin Peaks, which is centrally located in the San Francisco landmass about three miles from the tower. 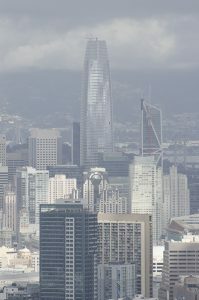 The building makes its own weather at its 1,070 foot height, disrupting most airflow that has come in through the Golden Gate just a few miles to its west, making its own clouds both in front of and behind the structure. 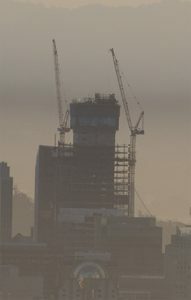 During construction, you could see work continuing well into the night — evidenced by two giant construction cranes at the top of the building with their red lights moving from side to side as beams were hoist into place. 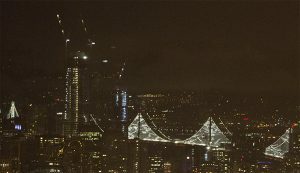 In this nighttime photo, you see three lighted spans of the (old) Bay Bridge on the right, then a second tower (blue lights), then the yellowish vertical lights of the Salesforce Tower, with two construction cranes at the top.The cranes and their towers were removed early in 2017. 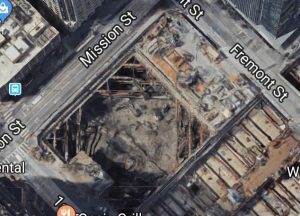 The Google Maps satellite view today (2017-12-18) still shows the site as it appeared before construction of the vertical structure had begun, approximately August of 2015. Below here’s my photo of the site before that time with a yellow concrete rig and other cranes on the still-flat earth of the site before excavation, but after piles had been driven deep into the ground. Behind it on the right in the photo is the steel frame of the Trans-Bay Terminal, a multi-block-long terminus for busses coming from the East Bay and North Bay. That’s a completely other story, with deep excavations and long caverns destined to hold busses and eventually high-speed trains to and from central and southern California. 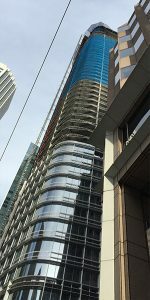 During construction we could view the building rising floor by floor around its concrete and steel core over the nearly two years of above-ground work from including most of 2016 and all of 2017. This pre-dawn photo is from May, 2016. When the glass exterior was completed, the building began to shine with reflections of bright sunsets, reflecting the rainbow hues from light blue above, down to reds and the yellow-red of the setting sun. The building takes on this set of rainbow hues at sunset and dusk most clear days. On other days, it may remain silvery grey, yet highly reflective, all day long. How do they keep all this glass clean? Yet another story to be told later. My last photo, here, gives you a hint of how they will be doing it. 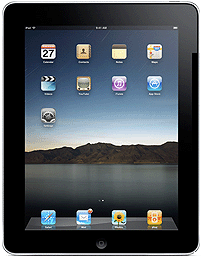 The two devices at the top remind me of window-washing rigs. 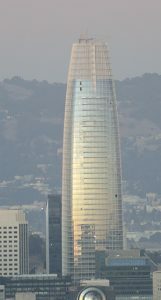 Great piece on newest building along SF skyline. Concise yet filled with artistic and engineering info!